CHITTAGONG: Twelve-year-old Nasima Khatun is second among four children of her farmer father Shamsul Haque hailing from Manikchhari upazila of Khagrachhari hill district. Nasima had been suffering from very low-vision for the last four years. Her illness put her farmer father into a great trouble. Being informed about Chittagong Eye Infirmary and Training Complex (CEITC), the largest non-government eye hospital in this region at Pahartali in the port city, he brought Nasima at the hospital. But, he was not actually ready for a good news that was waiting for him at the hospital. Nasima was chosen for surgery of her cataract by the international voluntary surgeons of Orbis, an international non-profit organisation working to eliminate avoidable blindness across the world. As per doctors’ advice, Nasima was admitted to the CEITC for getting prepared for the surgery at free of cost. Her surgery was conducted at Orbis Flying Eye Hospital (FEH), the world’s only US-accredited teaching hospital on board an MD-10 aircraft, at Chittagong Shah Amanat International Airport on Wednesday. This correspondent found her father Shamsul Hoque sitting at a room of the FEH before her surgery at the state-of-the-art operation theatre (OT). “I am very happy to get such an opportunity for treatment of my ailing daughter,” he said. At that time, some 45 eye doctors from different hospitals of the country were seen watching live surgery on an eight-year-old girl child very much attentively at a room in the aircraft. The surgery was being conducted in two rooms behind the space from where the doctors were watching it on a large screen. Dr Ramesh Kekunnaya, a voluntary surgeon at Orbis, was conducting the surgery and describing the steps one by one. He was also inviting questions over loud speaker from the doctors who were watching it. Not only for doctors on board the aircraft, the surgery was broadcast live for the eye care professionals at remote corners across the globe. Some doctors were also seen sharing their experiences through a modern simulator at another room of the aircraft which has also a three-bed recovery room for the operated patients. Coming out of the OT after completion of the surgery, Dr Ramesh, who works at LV Prasad Eye Institute at Hyderabad in India, said that they had screened some 26 patients on Sunday and finally chose eight cases for surgery. “During screening, we found that most of the children affected by paediatric cataract came to the hospital very late, which is not good,” he said. “Parents should bring their children to doctors as early as possible for eye check up so that the children get a very good care. We need to make people, including parents and schoolteachers, aware about the necessity to bring children to doctors and specialists early,” said Dr Ramesh. “It is also the aim of Orbis International. We are trying to create awareness and train people who are ophthalmologist, anaesthesiologist and other healthcare professionals, including nurses,” he said. “As local ophthalmologists are already doing paediatric cataract surgery, we are here to strengthen their surgical and clinical skills in a complicated situation. We are sharing the experiences to take their skills to the next level,” Dr Ramesh added. Global Medical Director of Orbis Jonathan Lord said that they are very delighted to be in Bangladesh with their flying eye hospital on an MD-10 aircraft. “This is our 10th visit to Bangladesh and fourth in Chittagong. 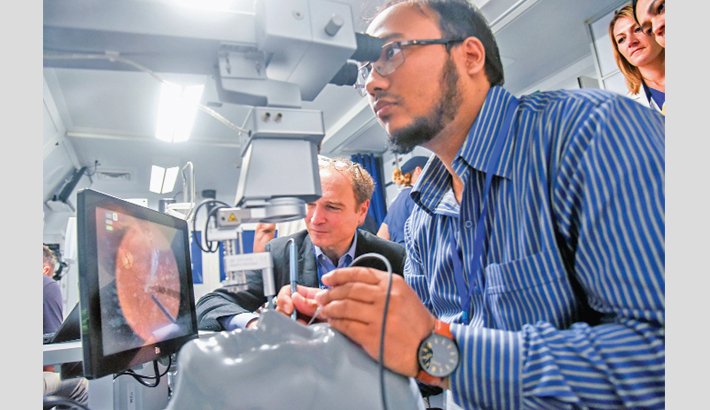 Our programme is aimed at increasing skills of local eye care professionals, including doctors, anaesthesiologists, nurses and biomedical engineers,” he said. “We have an office at Dhaka and Orbis started working in Bangladesh in 1985. It has kept a huge impact here in paediatric services,” the director said. “We have set up the first dedicated eye unit in Bangladesh. We have some projects running here and in India. We hope to enlarge the projects,” he said. Putting up statistics, he said that their programme emphasises on treating children along with others. Dr Nuzhat Choudhury, who came from Bangabandhu Sheikh Mujib Medical University (BSMMU) for receiving training, said that it is a great opportunity to have hands-on training and exchange of experiences from the international physicians. Terming the initiative as very much helpful, she expected the arrival of Orbis in Bangladesh regularly.